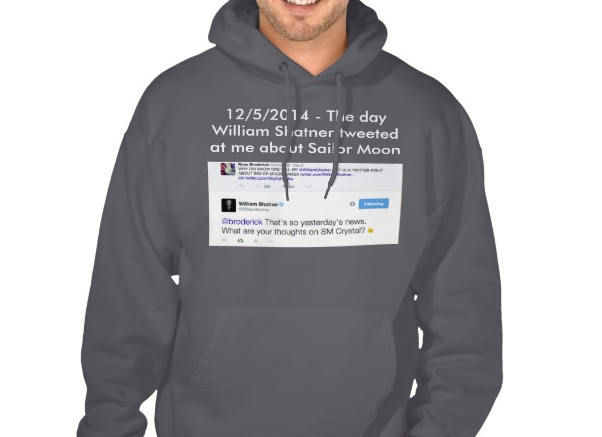 My Bizarre Quest To Make A Hoodie Out Of My Tweets With William Shatner About "Sailor Moon"
Like every good story, it all started when I got a coupon. 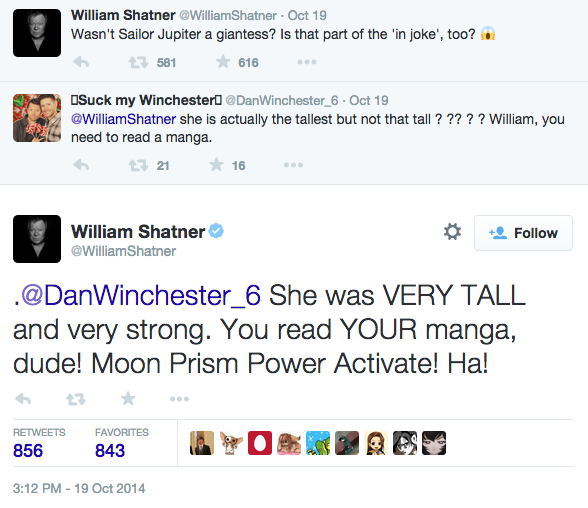 So this all started last month, when I came across a Twitter exchange William Shatner had about Sailor Moon. I freaked out about it and tweeted it out. Shatner found it, tweeted at me, and it was amazing. "SM Crystal" by the way is a reference to the new Sailor Moon Crystal series currently airing. @broderick That's so yesterday's news. What are your thoughts on SM Crystal? So skip forward to Thursday, I received a coupon from Zazzle. Zazzle is a website that lets you design any kind of clothing you want. So obviously, if the thing is going to be half-off, I'm going to totally make a shirt commemorating the time William Shatner tweeted at me about Sailor Moon. Except there was a problem. The tweet screencap was against Zazzle's content guidelines. They said it violated Shatner's copyright. I panicked because the coupon expired at 7 p.m. I was running out of time. So I bugged them on Twitter. @zazzle Hi Zazzle, I love your site. I had a design rejected for copyright. But it&#x27;s screenshot of a Twitter conversation I was part of. @zazzle Hi Zazzle, I love your site. I had a design rejected for copyright. But it's screenshot of a Twitter conversation I was part of. @broderick Hmmm...let us check with our Content Management Team and we&#x27;ll get right back to you. Thanks for reaching out! @broderick Hmmm...let us check with our Content Management Team and we'll get right back to you. Thanks for reaching out! I really wanted this hoodie, even if it meant trying to get Shatner's permission. @zazzle Would I need the other Twitter account&#x27;s permission to make the shirt? Even though the tweet was directed to me and made publicly? @zazzle Would I need the other Twitter account's permission to make the shirt? Even though the tweet was directed to me and made publicly? Zazzle called my bluff, and looped Shatner into the conversation. @broderick It looks like your convo was with @WilliamShatner, so we&#x27;re happy to print it with his permission! @broderick It looks like your convo was with @WilliamShatner, so we're happy to print it with his permission! So I went to work. I tried to rally as much Twitter support as I could. I only had a few hours left to restore my purchase before my coupon expired. The clock was ticking! And low and behold, he saw it! And like some kind of benevolent Roman emperor, he put it to a vote. 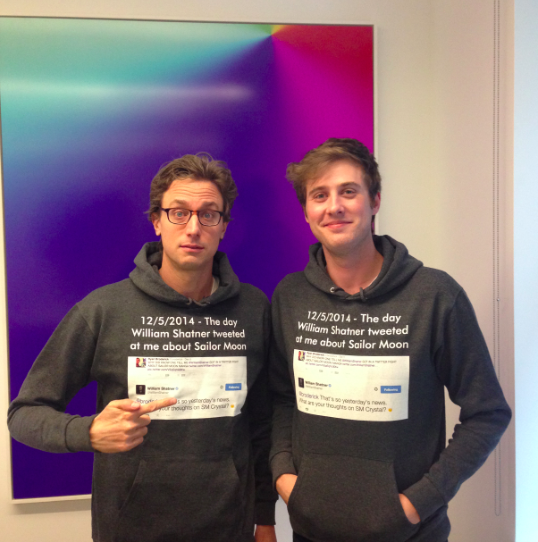 So how do you feel about a guy from @buzzfeed wearing this Twitter convo design to the office? https://t.co/ULR3udJjWD &#x1F44D; or &#x1F44E;? So how do you feel about a guy from @buzzfeed wearing this Twitter convo design to the office? https://t.co/ULR3udJjWD or ? I started getting pretty nervous. The internet isn't always a friendly place. And I really wanted this hoodie. What was even scary was Shatner started throwing some shade. My worry - is Buzzfeed the new Engadget? Are they all going to have a Sailor Planet attack on me? “@SoulPoet: @BuzzFeed It's a bit silly. I enjoyed my twitter convo w/ @reneauberjonois but I wouldn't make it into a shirt.” Who would? Then he gave me an ultimatum. I could make the hoodie, but ONLY if I could get BuzzFeed founder Jonah Peretti to take a photo with me while I wore it. Which, look, let's be real, when I was thinking about making this William Shatner Sailor Moon hoodie I did not expect I would have to explain myself to the head of BuzzFeed. But thankfully Jonah jumped in and made Shatner and Zazzle a counter offer. I felt like a pawn in an elaborate game of Twitter chess. And then finally, perhaps taking pity on me, knowing I had been masterfully owned, Shatner granted me permission to make the hoodie.
.@WilliamShatner @zazzle @peretti @BuzzFeed You&#x27;re my hero. Thank you so much Mr. Shatner! Zazzle engage!
. @WilliamShatner @zazzle @peretti @BuzzFeed You're my hero. Thank you so much Mr. Shatner! Zazzle engage! @WilliamShatner @priceline @peretti @broderick @BuzzFeed @zazzle this is amazing. @WilliamShatner @priceline @peretti @broderick @BuzzFeed @zazzle THIS is exactly why I &#x2764;&#xFE0F; Twitter! @WilliamShatner @priceline @peretti @broderick @BuzzFeed @zazzle THIS is exactly why I Twitter! I got the hoodie and they honored my coupon!